MAD. DESARGUS-LEMAIRE ET MDELLE. AMÉLIE GALSTER / dans / le pas de deux polonais. Even without the caption, the costumes worn by the two dancers would identify the dance as Polish. The square, flat-crowned caps and skirted coats with hanging oversleeves, trimmed with fur are characteristic of Polish national dress. Their pose looks a little lively for a polonaise, which was mostly made up of gliding steps, so they may be performing a dance based on the polka, which was extremely popular in the mid 19th century. The dancer on the right is performing en travestie, that is to say, a woman taking the man's role. The triumph of the ballerina in the first half of the 19th century gradually turned the spotlight away from the male dancer until ballet heroes were played by a woman, like the Principal Boy in pantomime. Two dancers stand side by side, each on tiptoe on one foot, the other raised; their arms are around each other's waist, and the outer arms are on their hips. They both wear square, flat-crowned caps with decorated with a plume over 'sausage' curled hair and heeled ankle boots trimmed with fur. One wears a wide-square-necked, belted coat-dress with full length sleeves and large open oversleeves with a calf-length skirt; the neckline, sleeve edgings, hem and around the shoulders and down the fronts are trimmed with fur. The other wears a knee-length belted coat with full sleeves and hanging oversleeves, all edges trimmed with fur; at the neck is a white shirt with stand-up collar. Rambert bought the first print as a wedding present but could not bear to give it away. 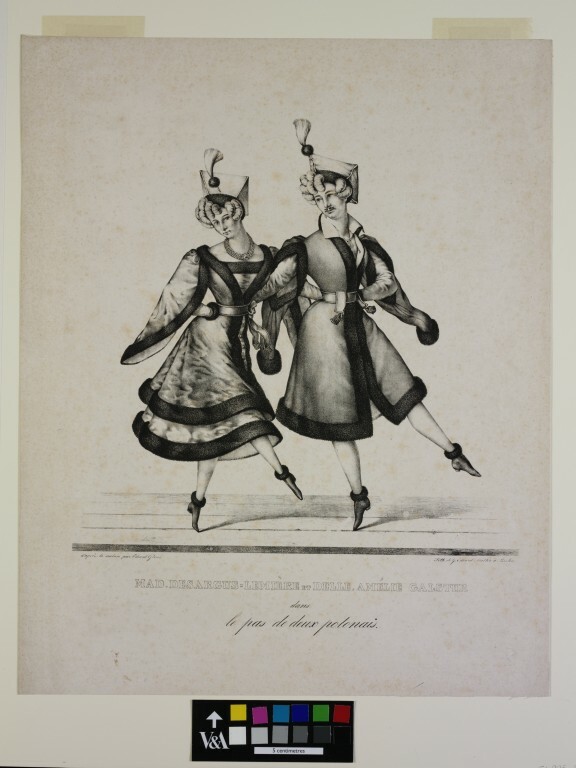 As the collection grew, it was displayed in the bar of the Mercury Theatre, the headquarters of Ballet Rambert, but in 1968, Rambert gave the collection to the Victoria and Albert Museum; seven duplicates were returned to Rambert, but these are catalogued in Ivor Guest's A Gallery of Romantic Ballet, which was published before the collection came to the V&A. 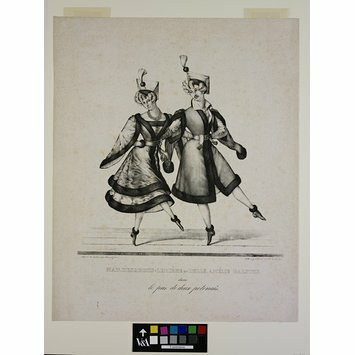 Although often referred to as a collection of Romantic Ballet prints, there are also important engravings of 17th and 18th century performers, as well as lithographs from the later 19th century, by which time the great days of the ballet in London and Paris were over. Mme Desargus-Lemière and Amalia Galster in the pas de deux polonais. Lithograph by G Eduard Müller after a drawing by Eduard Gleich, second quarter 19th century.